Awe. Am full of the warm and happies this morning :) Well, I'd obviously be even more full of them if I could still be in my warm bed cuddled with The Trucker right now (who is no doubt still fast asleep). But still. Tomorrow I can do that, and boy do I plan to! Plus today kinda has that perfect lazy bed morning weather ... All overcast skies and grey. It's been a good week. Okay so I only managed to make it to Boot Camp twice this week again ... Monday and Tuesday are the easy ones. It's getting myself back there on Thursday that I'm struggling with. So yeah, I did that. And I skipped SCM Dinner on Tuesday evening. Was feeling decidedly blue and anti-social at the start of this week. So that was fun. Then last night, The Trucker and I had a wonderful evening. It wasn't really planned as a Surprise Date Night, but I guess it did sorta turn out to be one. 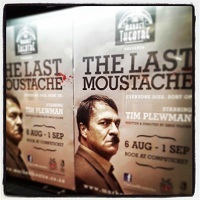 I'd booked us tickets to go see Tim Plewman's new show, The Last Moustache. But, first we needed dinner. So I did some hunting online and found the facebook page for 86 Public (after accidentally calling the number on the Google+ page which is incorrect ... it belongs to Percy who was involved in the start-up of the restaurant, but he was very helpful) and made a booking. Oh. My. Word. I think this was the cherry on top of our evening. What a fantastic little pizza spot. They don't have their liquor license yet (they'd told me when I booked and their corkage pricing, but we opted not to take any along), but we enjoyed our Coke Zero in wine glasses. And we ordered 2 of their medium-sized pizzas to share. Superb. Loved them both! We had number 27: Bacon, dark chocolate, feta and pear (the last time I had a combo like this was at Lapa Fo, now closed, which I'd loved but haven't seen it since, so I could not resist!) and number 19: Bacon, chilli, feta and avocado (yes, yes, my standard). They have some other delish sounding options, but The Trucker wasn't up for a veggie pizza :( Haha. And then we popped over the Nelson Mandela bridge (which was very colourfully lit up) and headed to the construction site that is currently the Market Theatre. I am very curious to know what they're doing there. And there seemed to be a lot of parking confusion (Standard Bank's Joy of Jazz is currently on and people seem to be trying their luck to get into the Theatre's parking area). But we managed fine. And then had a quick drink at the bar before heading in to watch The Last Moustache. It was amazing. It's 75 minutes non-stop. He plays a myriad of different characters to tell the story, the alternate story of Hitler's last days. It's not a comedy, although there are funny moments. It is, however, brilliant. Well scripted, spectacularly acted and very clever. Also, it worked superbly well in the intimate theatre setting of the Laager Theatre. It's still showing for another week, so I reckon you should get yourselves tickets! Acting is a weird profession. I love it, but it is weird - like going to the office and pretending to be someone else for an hour or two. 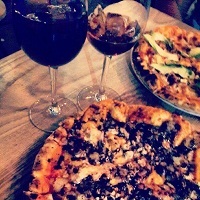 That first pizza combo with the chcocolate sounds quite different! Oooh, I really enjoyed that Defending the caveman too, maybe I need to make a plan to watch this one.